Tax Free Income through non-working Spouses – Time to clear the myths!! Tax Savings through non-working spouse – Is it possible? One of my client took a personal loan since he knew he needed money, but after his loan amount was received, his requirement got deferred for some time. He transferred the money to his spouse’s account and fixed it as deposit, assuming the interest that is generated is tax free( if form 15G submitted at bank). He showed me his calculation on how he will earn more than what interest he pays towards the loan. I had a two hour discussion with him and I spent more time analysing his calculations. Unfortunately, the calculations he made went wrong, as this “interest” income from non-working spouse’s fixed deposit is not tax free. This is a commonly observed phenomenon. Transferring money to spouse’s account and book Fixed deposits or buy rent generating properties, assuming that this is treated as gift to family member and are not liable to pay tax on the interest earned. 1. Gets clubbed with husband’s income . 2. Such income is taxed at husband’s tax bracket. Then what is it that we can do , to make our hard earned money do some hard work for us? Solution 2: If so much lock in not possible, you can park the amount in debt mutual funds or liquid funds or can set up an SIP (Systematic Investment Plan) into equity mutual funds, which are more tax effective than Fixed Deposits or Recurring Deposits. In simple terms, money can be gifted to your non-working spouse – but this amount must be further invested into instruments which generate tax free returns. Only such cases where returns alone are tax free are not clubbed with your income. Such tax saved is your rupee saved and rupee earned. Time to make your money work hard for you !! Deepa Nittala is a practicing Financial Planner and a veteran banker, working with a multinational Advisory Firm in Hyderabad. She is into unbiased advisory and guides people with comprehensive financial planning services. She can be directly reached at deepanittala at gmail dot com. This article aims at providing information for benefit of ApnaComplex customers and blog readers. We recommend you to please use the information only as a guidance for further discussion and action with help of relevant financial planning professionals. If you need professional advise on this topic you can please reach out to the author through email mentioned above. We are running a radio campaign from today for few weeks in some of the FM channels. Below are links to the actual advertisements that are played on Radio. We had loads of fun in conceptualizing, creating, recording them. Drop a comment if you like them or if you have heard them live on radio! The tax season is here. With help of Ms. Deepa Nittala, a practicing Financial Planner and veteran Banker based out of Hyderabad, the team at ApnaComplex is bringing a series of financial planning articles that our users and blog readers can make use of! We are starting with basics of Tax Planning as the first in this series, now that the tax season is here! January to March which is casually referred to as “tax season” is the most critical period of the year as far as taxes are concerned. This is because of the impact on the net income that will hit your bank account in February / March due to the tax deductions that will happen on your salaries! Somebody who has planned taxes well during the year is at ease during this period. Others, who have been unplanned, finds this season as the toughest, busy buying any product which promises a tax exemption or deduction from taxable income. Resultantly, this period shrinks the disposable income to a large extent. One, because of excess tax deduction. Secondly, because of last minute tax-saving product purchases. There are various tax exemption options and there are innumerable articles written on the same on internet. A snapshot of the various options is provided below. A little bit of understanding of how to plan for your taxes can help you from all the unplanned and mostly incorrect spend on products that claim tax savings. When is the best time to plan taxes? January to March. “Surprised”? Yes. January to March is the best time to do tax planning, or for that matter, financial planning for the forthcoming financial year (NOT for the current financial year that is ending). Such planning helps us to analyze our resources and decide on future action steps to save money the smart way. This way it helps us to distribute the investments across the forthcoming financial year, and not lead to a concentrated effort towards the end. Which are the best options to consider? For any individual, one of the most important requirements is to have sufficient life insurance coverage. However, most of the times, this requirement has been misinterpreted and confused with investment options. This is because, we have not analyzed “why are we purchasing the insurance” and always look for a return on every investment we make. The breadwinner of the family has the responsibility to take care of all the needs of the family. The needs include regular living expenses, children’s education, their higher education, their marriage, paying off all liabilities, etc. So when an event takes the breadwinner away from the family, all the above needs get effected. Like we have a plan B for every plan A, Life Insurance coverage is the plan B which takes up the breadwinner’s responsibilities and tries to fulfill them. Research reveals that only 26% of the Indian population has some insurance policy or the other. In the given 26% also, the average coverage is less than Rs 2 lakhs. Now, if we weigh the above financial responsibilities against the cover, we will understand how grossly under insured we are. The best solution to this is use a portion of the 80C limit and purchase TERM INSURANCE coverage. A TERM INSURANCE is a pure risk cover for life, where one pays a small premium to get a large life covered.e.g., a healthy 30 year old can spend Rs. 10,000 approximately to obtain a cover of Rs 1 Crore. Post using up the above deductions from 80C, we can use the remaining limit to invest in PPF. PPF is an excellent way to create a disciplined saving on a long term basis. 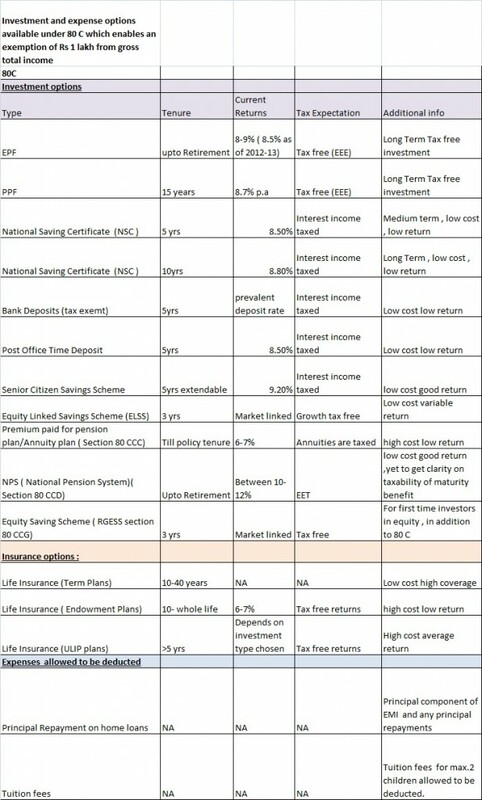 PPF is a EEE (Exempt-Exempt-Exempt) product with tax exemption at all stages, and helps us to create a good corpus in the long term which can add up to retirement fund. It should be considered mainly because there is less tendency among us to save towards long term goals like retirement, except contributing towards EPF. This is a wise pick for 80C. This completes your planning for tax saving schemes – rather easily! It’s important to keep life simple, use simple products to invest and not complicate our needs with expensive products and end up with guilt of not using money in the right way. Deepa Nittala is a practicing Financial Planner and a veteran banker ,working with a multinational Advisory Firm in Hyderabad. She is into unbiased advisory and guides people with comprehensive financial planning services. She can be directly reached at deepanittala at gmail dot com.